Dulwich Folk Choir, The | The Goose Is Out! 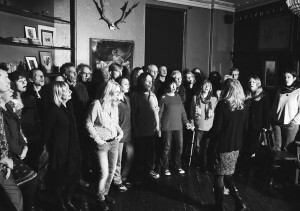 The Dulwich Folk Choir is a community choir whose members have been singing together since 2012. It is led by the fantastic Aimee Leonard, who moved to South East London from Orkney ( not to start the choir though, we think!). As its name suggests, the choir sings folkie songs from all over the world, with many from Orkney. They are usually unaccompanied, apart from Aimee’s bodhdran. They/it have/has already made a number of public appearances, including at The Dulwich Festival Fair on Goose Green, various events in Dulwich Park, and at The Ivy House before Christmas. Many of the choir members are also regulars at our Goose Singarounds, where they sing both individually and together. And many of our Singaround regulars have now joined the choir! So there is quite a big overlap. If you are interested in joining the choir, everybody is welcome. It meets on Tuesday nights Upstairs at the EDT (the large pub at the end of Lordship Lane just by the roundabout at Goose Green), from 7 – 9pm, apart from during the school holidays. There are no auditions, you don’t need to read music, and you can sing whichever part you want for each song – low in one and high in another if you like! It’s four pounds per session, pay as you go 🙂 and you don’t need to go every week. You can just turn up, but if you’d rather speak to Aimee first, just contact the Goose and we’ll let you have her email address.